"facilities while clean are basic"
Not Verified | This airport while still considered fairly new is still so very basic. The upstairs 3rd floor so called food court is a joke. The food is so basic, stale & expensive for what you get. With their limited English it makes it harder also. 3 of the places were on a break but still had limited menu. This food court needs a fast food outllet like most international airports. Most staff were friendly but facilities while clean are basic. "quite small but well maintained"
✅ Trip Verified | The airport is quite small but well maintained. There is no drinking water facilities for passengers. A 500ml bottle of water at this airport costs 1 euro. Wifi is available but it doesn't works (even the login page doesn't open). There was no cafe or restaurant at the airside zone. Most announcements are done in Russian and Kazakh. There were hardly any English announcements. "new terminal is now open and is spectacular"
❎ Unverified | The brand new terminal is now open and is spectacular. Any deficiencies from previous reviews are now remedied. More gates with jetways, more shops and restaurants. Check in was seamless as was immigration facilities. Clean and modern and when the new train system is functioning, it will be easy to get into the city. 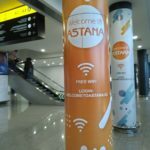 "transferring between flights quick and easy"
✅ Verified Review | Astana is a small international airport, that is well connected to Europe via Frankfurt, London, Paris and Amsterdam through Kazakhstan's Air Astana. 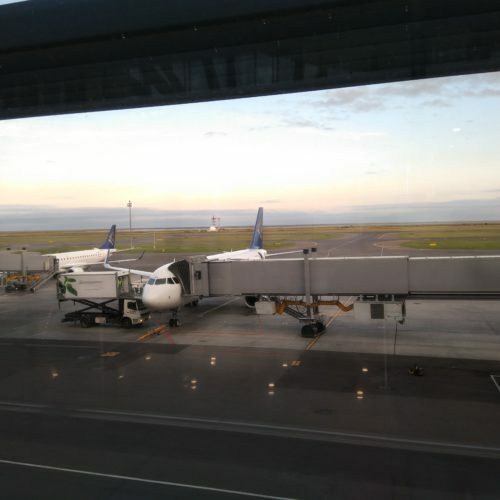 The airport has only one terminal for Domestic and International flights. A new terminal is being constructed next to the existing facility which is planned to be opening in spring 2017. The arrivals and baggage reclaim is small. Immigration quite smooth and officers were friendly, but remember to fill in your immigration card with a blue or black pen, not with a red one as it is not accepted. I had almost no queues. Taxi pick-up at the terminal is not well-organised and taxi recruiters can be annoying. The central hall for departures is quite spacious and there is sufficient seating around the check-in area. Check-in areas are small and somewhat old-fashioned, but work fine. Friendly ground staff. Short queuing time at check-in, passport control and security. Emigration passport control is fine. There are few F&B and retail facilities at the international departure gates. There is plenty of seating at the end of the concourse close to the small cafe in the back. Transferring between international flights is quick and easy. Passengers do not have to pass immigration, only security screening. It took me only 5-10 minutes from arrival gate to departure gate. F&B and retail facilities are limited, especially in the departure are after immigration. Food choice is limited. Very good wifi while waiting for check-in or for your flight. Password can be obtained via SMS. Terminal and toilets are clean. Remote arrivals and departures (via bus) in winter when temperatures can go below -20 Celsius can be cold and slippery, but also a very interesting experience. When the new terminal will be opened in 2017 I assume less aircraft will be handled via busses. When I arrived at Astana Airport, the structure was reminiscent of the soviet-era. The arrivals was less organised, with the baggage claim being crammed into one spot that is too small. 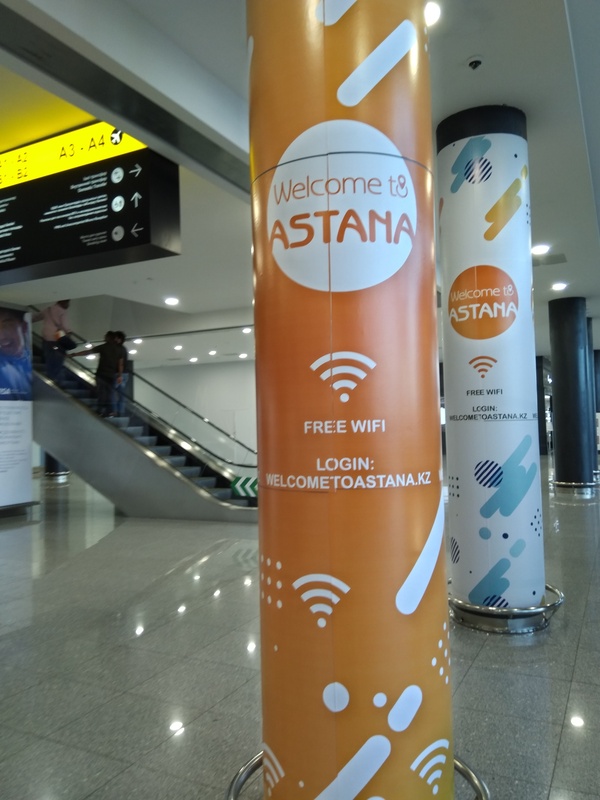 Check in at this airport is close to impossible, Air Astana only use two or three counters for economy class and one for business. The security check is organised, the gates are organised, the cafès are nicely organised, but the staff could speak a little bit more English. Passport control takes a little bit too long, but not as long as some airports. 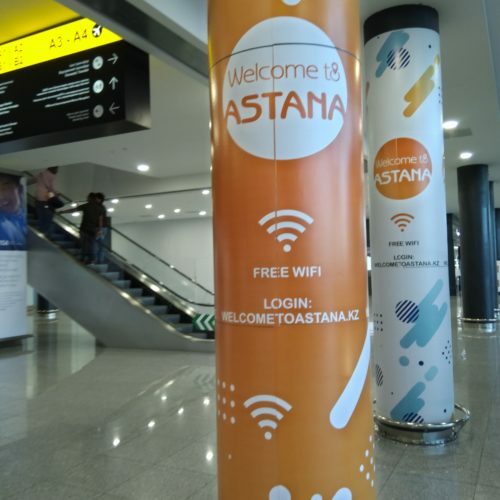 Astana airport is small but very good. The staff is ok. The wifi connection works pretty well queuing times are very short. 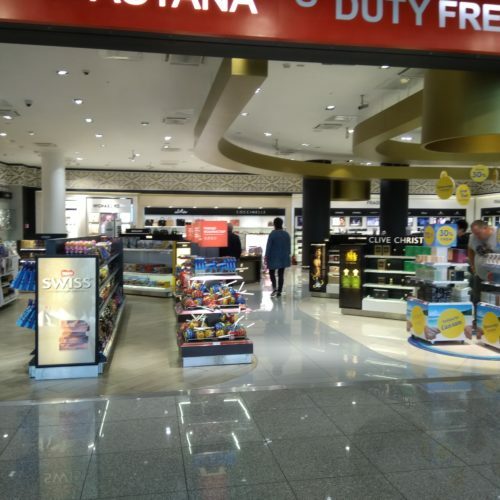 There is only a few shops in the airport but that seems to be enough for it. The exterior and interior design is very good. This airport has excellent free wifi but lacks any decent shops or restaurants. I stayed in the airport for 5 hrs whilst waiting for a connecting flight. The check-in agent wouldn't check my bag through so I was stuck at the airport. The best area for wifi is on the 2nd floor. There are power-points behind the bench seats for charging your laptop. Airside there are small shops and a cafe/bar at the very end of the departure lounge where the wifi doesn't work. As a capital city airport it is lacking in many of the things one would expect. Without the wifi it would be very hard to pass the time waiting for connecting flights. Small ultramodern terminal. Check-in was fairly efficient except for flatheads who queue-jumped. In the end I had to spread my elbows to get attention. Business-class desk not manned. Unable to check-in bags or myself to connecting flights (even on the same airline). There’s not a great deal to do in the airport whilst waiting for flights. Once airside all there is is a small bar. In theory the terminal is non- smoking though there is a separate smoking room but the whole terminal smelt of smoke most of the time I was there.